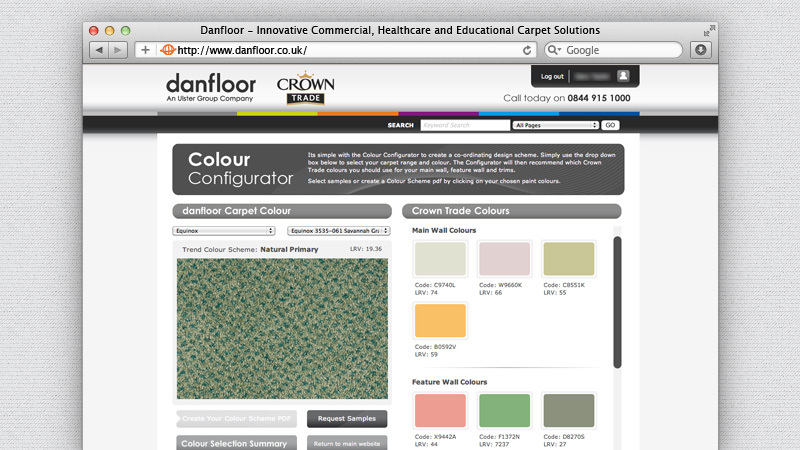 Web application that makes the most of Danfloor’s relationship with Crown Paints! After a successful first year with their brand new website, Danfloor were looking to provide customer service applications that would intuitively lead the customer to the right product. This all came to fruition after Danfloor forged a working relationship with the Crown Paint company. Createanet was approached to provide a unique web application that makes the most of this relationship. Working closely with their design team, the idea of the colour Configurator was born, enabling customers to select colour schemes that will then return relevant carpets and paint surfaces. Danfloor now has a completely configurable system that can be controlled from within the content management system, allowing them to set their own paint schemes and matching carpets and paints. Once the user has selected the relevant carpets and paint schemes the system automatically generates specification sheets in PDF format, which can easily be forwarded on to clients and project managers. Danfloor’s clients immediately took to the system and it has proved very successful in generating additional sales as well as providing a much smoother user experience.